StageBuzz.com: FRIGID New York Interview - Steve Boleantu of "TIRED WAVE STOP!" FRIGID New York Interview - Steve Boleantu of "TIRED WAVE STOP!" Mainly in high school and through the Sears Ontario Drama Festival - where at least 23 other secondary schools compete in three rounds by district, region, then provincially. Our school made it to the provincials each year, so there was always room for playing. 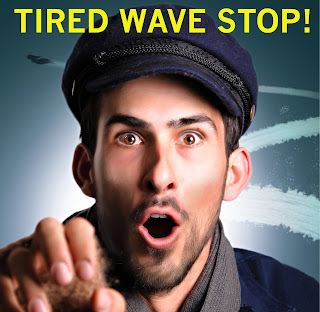 Tell me a little bit about TIRED WAVE STOP! An old curmudgeon, the Sea Captain, searches for his mermaid-wife. He despises dry land, living by a strict code: solitary life at sea... until he discovers their baby aboard, who is land-obsessed, forcing the Sea Captain to examine the costs and rewards of his stubbornness, aboard his little boat. I've wanted for awhile to write a father-son story based on my relationship with my father. But I didn't want to take it so seriously. Taking my experience as a sailor, it made sense to set it in a fantastic world of adventure - to take what I know of the sport and of my father, and fictionalize these accounts - making it on the high open seas to give these two characters nowhere to go but face what problems together in their own way. Roger Bainbridge was dramaturge from the very early stages about two years ago up until the Toronto Fringe Festival last year. I've been working with Roger for about 6 years, mostly in sketch comedy. Miguel Rivas was director, and for about 8 years I have worked with him extensively in our sketch comedy troupe, Frenzy. Tim Moore was set designer. We've worked together for about 5 years in film, anything tech-related, or for any ideas, help, or suggestions on projects. Tired Wave Stop! was drawn from the CAFF touring lottery this year. Next up will be Montreal, Calgary, Edmonton, then Vancouver. Before Montreal, I will also be performing Tired Wave Stop! at the Royal Hamilton Yacht Club, a little site-specific, using a sailboat as the stage space. Let your imagination go for an hour, and I hope you have as much fun as I do.